Vitoria-Gasteiz is the capital of the Basque Country, and with 240,000 inhabitants a Europe-leading municipality investing in green economy. The city, which was the European Green Capital in 2012, has a high proportion of green public areas, ensuring that the entire population lives within a 300m distance from an open green space. Numerous tangible measures are in place to assist and increase biodiversity and ecosystems services. The city also has a clear strategy to become greener, promoting energy efficiency, renewable energy, low carbon mobility and smart infrastructures. Vitoria-Gasteiz is committed to becoming smarter, using modern technologies to improve the quality of life of the citizens. They are at the core of the smart city concept, as it is not possible to become smarter without engaging the citizens in the decision making. They play therefore a key role in the definition of strategies covering ICTs, mobility, energy and urban environment, working together with public bodies, the private sector and research agents. Demonstrate Building Retrofitting: 750 dwellings (60,000m2) in the Coronation district will be insulated, and their energy systems replaced with a connection to the district heating. Integrated Infrastructures: A new biomass (wood chips) district heating network will be deployed, and integrated energy management systems will optimise efficiency at home, building and district level. Sustainable Mobility: Acquisition of EVs (taxis and private cars) will be granted, and the recharge network will be extended. ICTs: An Urban Management System (UMS) will be developed and deployed. Vitoria-Gasteiz, as the rest of the Basque Country, relies almost completely (more than 90%) on the import of fossil fuels both for direct use (natural gas, petroleum products) and for electricity generation. A natural gas network is available throughout the city, and is widely used in industry, residential and service sectors. Cogeneration units are installed in a few public buildings such as hospitals, and to a minor scale in some residential buildings. Petroleum products are the main fuel for transport. Biomass fuel is used in some public buildings and swimming pools, but its use remains very low in percentage. 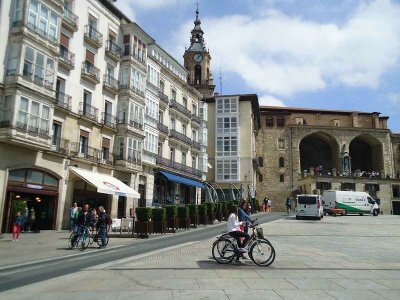 Vitoria-Gasteiz aims to reduce its energy consumption by rationalizing energy use and promoting the use of more efficient technologies such as district heating and micro-cogeneration, as well as greater energy efficiency in new and refurbished buildings. At the same time, the city aims to promote renewable energy sources such as solar power, geothermal systems, wind farms and biogas from urban waste. In line with these objectives, the city council adopted a Climate Change Prevention Strategy in 2006, and agreed to cut emissions by 16% by 2012. In 2009, it signed up to the Covenant of Mayors and in 2010, approved the Plan against Climate Change, promising more ambitious reductions. The city’s long-term objective is to become a carbon-neutral zone, with an interim goal of cutting emissions by half by 2050, through wide-ranging actions in different sectors and public education. As one of the city’s most vulnerable neighborhood, the Coronación district will see a considerable number of residential buildings fully renovated, including their façades, insulation, windows and doors. As there are no local housing associations in the city, Vitoria-Gasteiz prepared a citizen engagement strategy that will help to communicate and negotiate with each and every apartment owner in the pilot area .